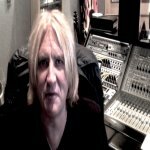 Def Leppard singer Joe Elliott has recorded a video message for Spanish fans ahead of the tour with Whitesnake and Europe. This will be the band's first visit to the country since October 1996 on the Slang tour. The tour kicks off on 23rd June and as confirmed recently will not feature the full 'Hysteria' album. Watch the brief video below filmed at Joe's home studio. "Hola Amigos! Joe Elliott here from Def Leppard very happy to announce that we are coming back to Spain with our very good friends Whitesnake and Europe. We will see you this summer in San Sebastian, Barcelona, Madrid and Santiago de Compostela. Saludos!."